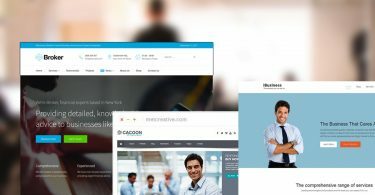 In this post, we have come up with the best hosting WordPress themes for web hosting companies, domain registrars, server providers and resellers to help them create powerful website effortlessly. Hosting is one of the fastest emerging business with the ever-increasing buzz around the cloud services. 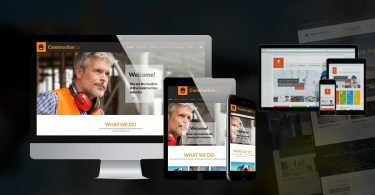 These premium themes are responsively designed to provide visitors a remarkable viewing and navigating experience on their tablets, smartphones, desktop, laptop, iPhone, iPad and android devices. Hosting firms and resellers can showcase products and sell rdp or vps online. 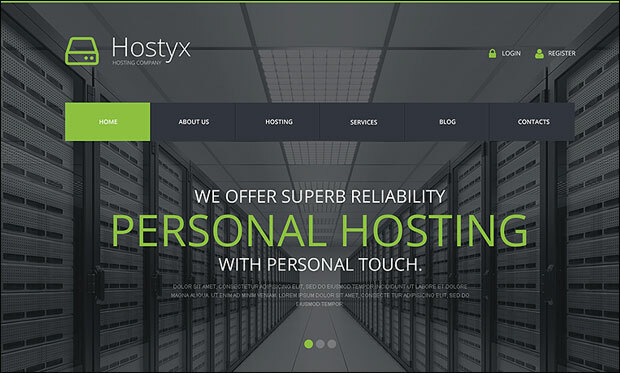 Now, take a look at the 25+ Best Hosting WordPress Themes for your wbeiste. If you are in search of a premium WordPress theme for your hosting business then Alaska would be the perfect one. This theme is based on bootstrap 3.3 framework and compatible with WHMCS-Bridge plugin for connecting WHMCS with WordPress. Alaska theme features Google analytics to help you keep a track of the number of visitors landing on the pages, conversion rates etc. It supports WPML plugin for translating the content to different languages. 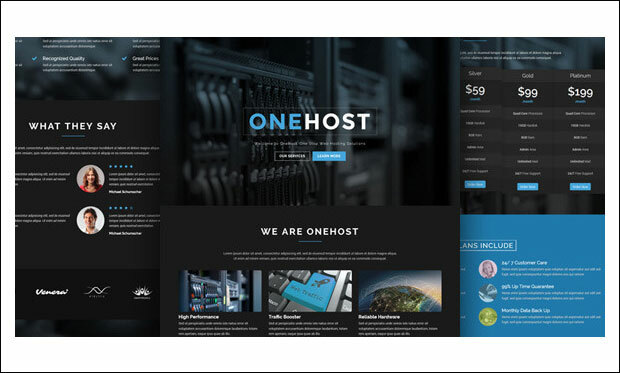 As the name suggests, Onehost is a one page hosting WordPress theme that is compatible with WHMCS-Bridge plugin. It includes XML demo data to help you get started with your own site quickly. It features drag and drop visual composer page builder for building unique page layouts. You can customize each and every aspect of the theme using the powerful theme options panel. Seven Host is an amazing hosting WordPress theme that is based on bootstrap 3 framework. It is built with valid HTML5 and CSS3 coding techniques. This theme is fully compatible with WHMCS and WPML plugins. It is search engine optimized to improve the ranking of the website on Google, Bing, Yahoo etc. Due to its responsive and retina ready feature, this theme looks sharp and pixel perfect on all screen sized devices. It’s a clean and simple WordPress theme that supports integration of WHMCS-Bridge plugin into the site. 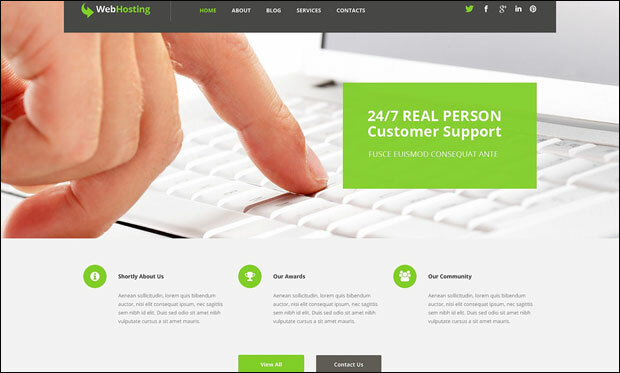 FlatHost theme is powered by jQuery and compatible with WPML and Zompim live chat. Users can easily install and setup the theme without worrying much about the coding part. It includes domain search form, custom widgets, Google fonts and drag and drop page builder. 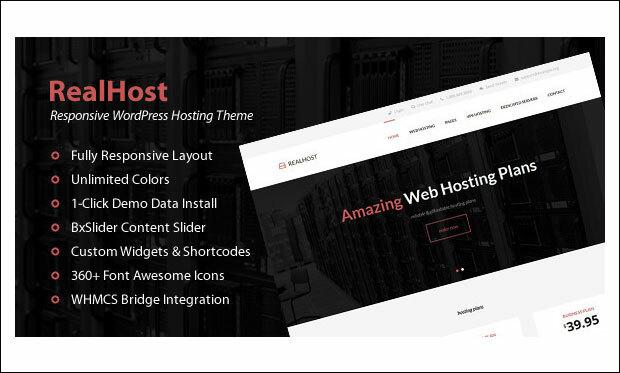 Megahost is one of the best WordPress themes for creating hosting websites. Based on bootstrap 3 framework, this theme is compatible with WHMCS Bridge plugin. Give your site a unique look and feel by choosing from 8 skins and multiple layouts. It features Google contact map to help customers easily track down the location. Megahost offers lifetime free updates and extraordinary support to the premium users. 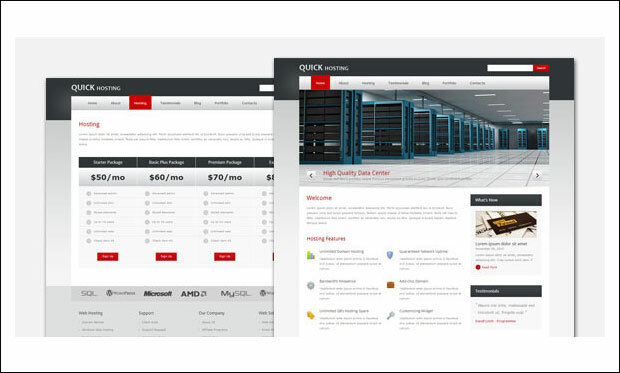 Quick Host is a business and hosting WordPress theme that is based on Klasik framework. Images uploaded onto the site are resized to the default width and height due to its auto image resizing feature. It includes .po file for easy translation of the entire website. This theme is well documented to help users get started with their own site easily. 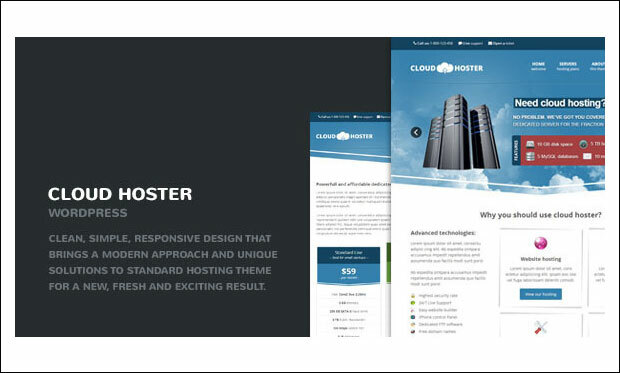 Cloud Hoster is a clean and simple WordPress theme designed for hosting companies and those who want to provide cloud services. It is built with twitter bootstrap framework and 960 grid system. This theme features revolution slider to help you craft attractive 2D and 3D slides. It includes PSD files for easy customization of the website. Cloud Hoster also includes newsletter signup and working contact form with validations. 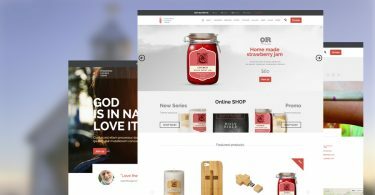 RealHost is an attractive WordPress hosting theme from Theme Forest. This theme supports integration of WHMCS Bridge plugin into the site. You can easily install this theme by importing the demo data in a single click. 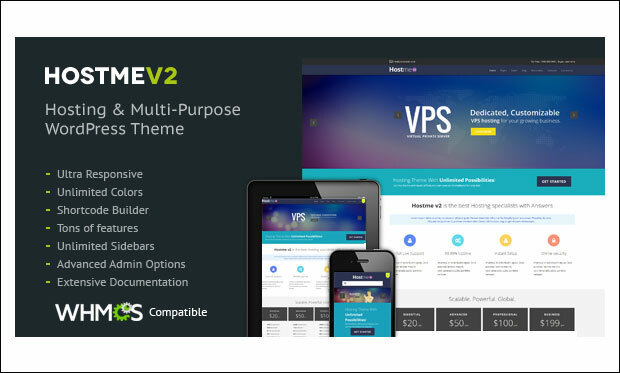 Key features are VPS slider, 360+ font awesome icons, custom widgets, goggle fonts, BxSlider content slider, custom page templates, shortcodes, Google fonts and quartz responsive menu. 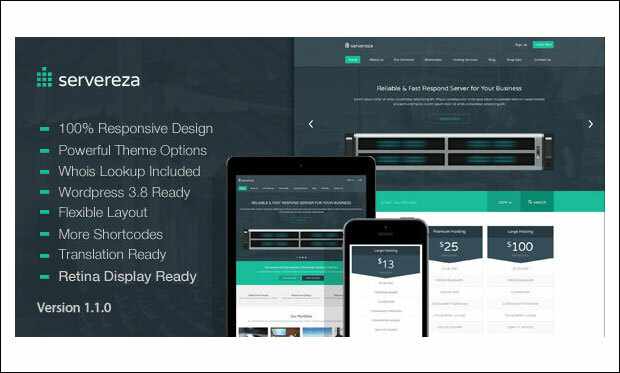 Servereza is a fully responsive and retina display ready WordPress theme for hosting websites. This theme comes with powerful theme options for changing different elements of theme to suit your needs. It features flex slider for creating slides with stunning transition effects. This theme is tested to run well with popular browsers like Firefox, Safari, Opera, Chrome, IE8, IE9, IE10 and IE11. 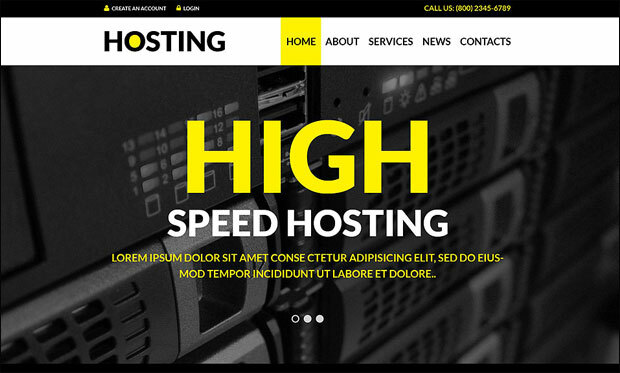 Hostme v2 is a minimalistic designed WordPress theme that is coded with HTML5 and CSS3 techniques. This theme is well suited for creating hosting, portfolio and other websites. The ultra responsive layout of this theme perfectly scales down on devices from large desktop computer to smartphones. It is SEO optimized to enable search engines to crawl and index the web pages. 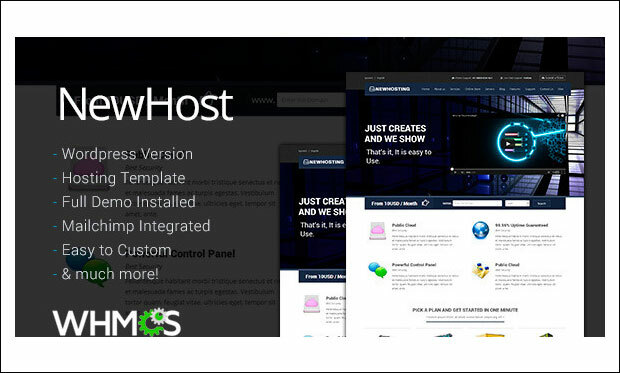 Newhost is an elegantly deisgned hosting WordPress theme that is inteagrted with WHMCS. This theme is based on bootstrap 3 framework and programmed with valid HTML5 and CSS3 techniques. If features options panel with easy to edit options. Whenever user faces any issue related to the theme then they can make use of the detailed documentation to get their site running out of the box in no time. Chester is software and hosting WordPress theme that comes packed with powerful features for easy creation and customization of the entire website. 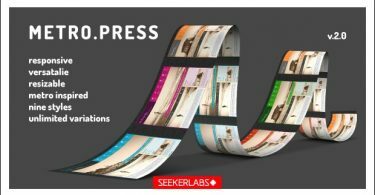 It includes premium revolution slider to impress your visitors by creating stunning slideshows. This theme is based on bootstrap framework and fully integrated with MailChimp. You can easily embed contact form into the site to establish interaction between website owners and customers. 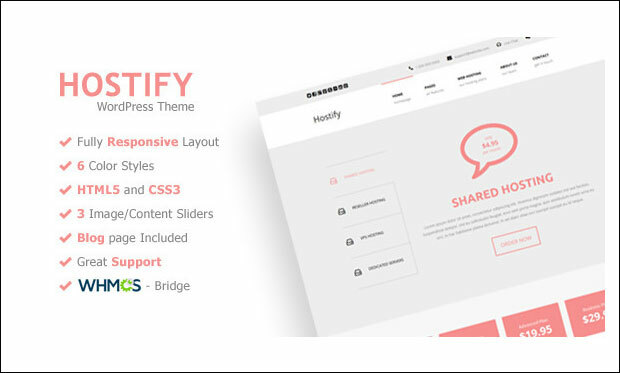 Hostify is a simple responsive WordPress theme especially designed for hosting providers. It is coded with the latest HTML5 and CSS3 coding technologies. Design your site by choosing from 6 colour styles, 450+ font awesome icons and Google fonts. It is compatible with WHMCS bridge plugin. This theme features 3 image and contact sliders, custom page templates and superfish drop down menu. 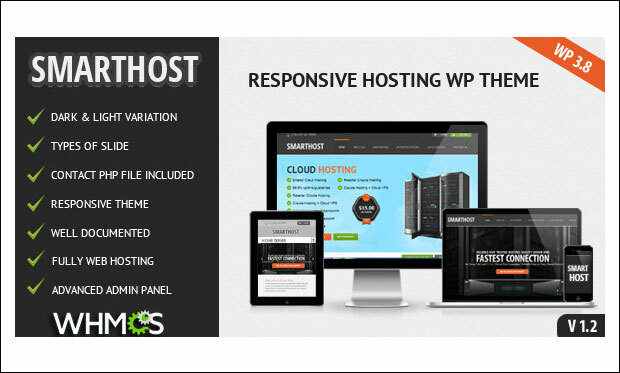 Smart Host is a decent looking WordPress theme suitable for building hosting websites. 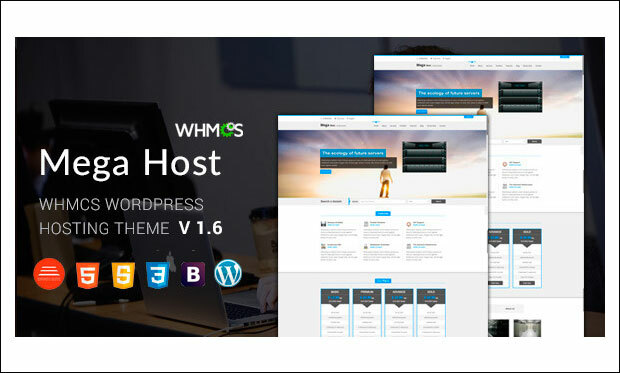 This theme is fully integrated with WHMCS plugin for submitting ticket, making announcements, managing orders and affiliates, client area, domain checker etc. Give your site a unique look and feel by choosing form light and dark variations. It includes 24 social media icons to enable customers to share important data across the social networking platform. 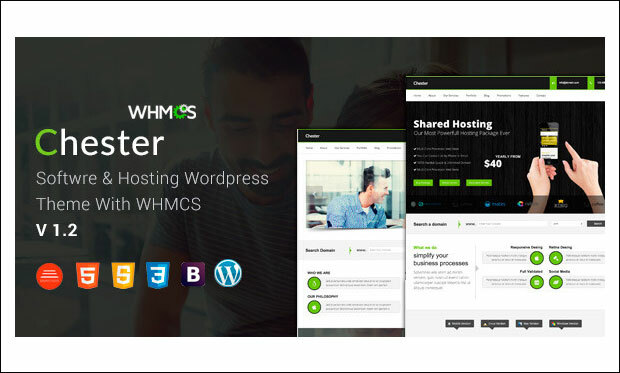 Active Host is a modern hosting WordPress theme that comes packed with essential features to match the taste and needs of the users. It includes powerful page builder for creating multiple page layouts by simply dragging and dropping the controls. This theme is integrated with WHMCS log in and domain lookup. It has two WHMCS order templates and loads of custom widgets for displaying data. Epicon is a minimalistic designed multipurpose WordPress theme from Theme Forest. This theme includes 3 homepage layouts for hosting, corporate and hotel. 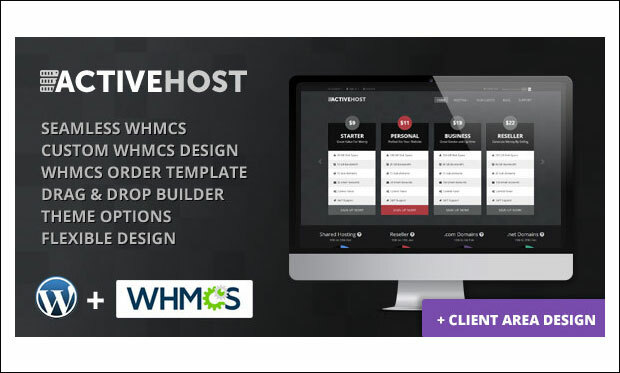 The layout hosting template is integrated with WHMCS. It includes 8 predefined colour schemes and offers users with unlimited colour possibilities to make site visually appealing and attractive. Epicon is search engine optimized to improve the appearance of the site on Google, Bing, Yahoo etc. 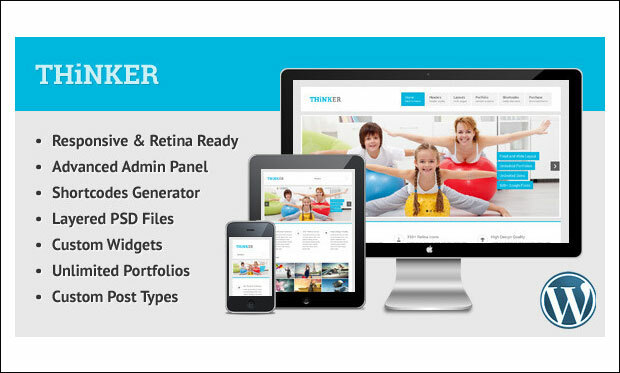 Thinker is a beautiful multipurpose WordPress theme with powerful CMS functionality. 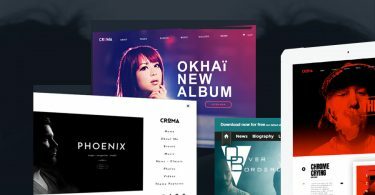 Give your site a unique look and feel by making use of unlimited skins, custom widgets and unlimited portfolios. By using advanced admin panel, you can customize every aspect of the theme without touching any coding line. It includes layered PSD files for easy customization of the entire site. Thinker is compatible with WPML multilingual plugin and includes .po and .mo files. 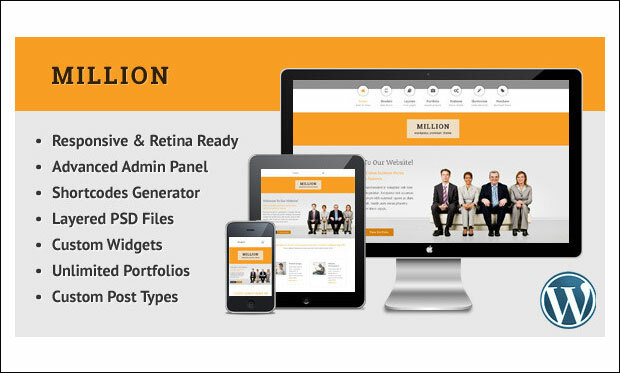 Million is a multipurpose WordPress theme that comes jam packed with useful features for easy creation of the hosting website. This theme looks sharp and pixel perfect on devices of various screen sizes due to its fully responsive and retina ready feature. You can create unlimited portfolios, galleries and 2D and 3D slides. It features visual shortcode generator with 150+ shortcodes to boost the functionality of the site. 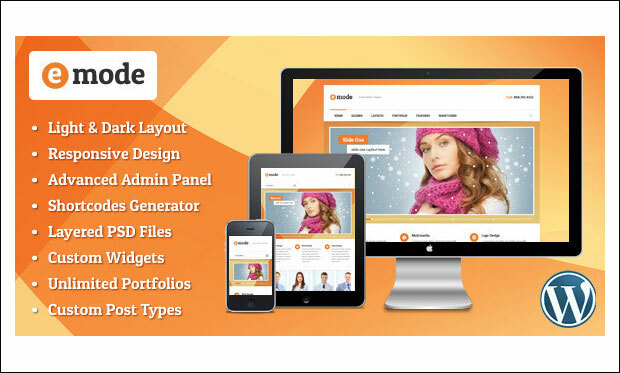 emode is an impressive multipurpose WordPress theme that can be used for building hosting websites. 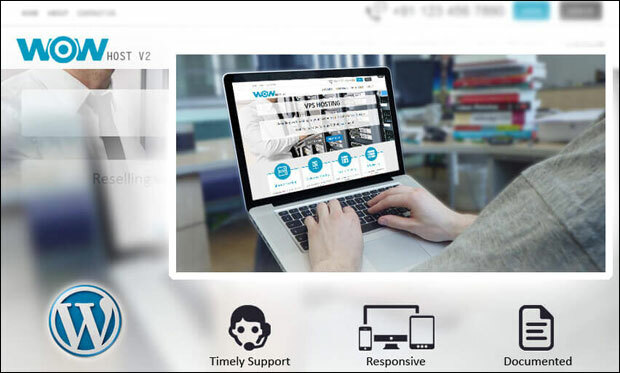 It features powerful CMS functionality and lots of theme options for customizing different elements of the theme with ease. 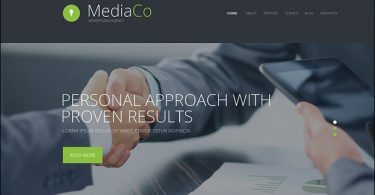 This fully responsive theme perfectly adjusts on desktop, laptop, iPhone, iPad, tablets, smartphones and mobile devices. It includes 7 custom post formats for inputting data into the site. 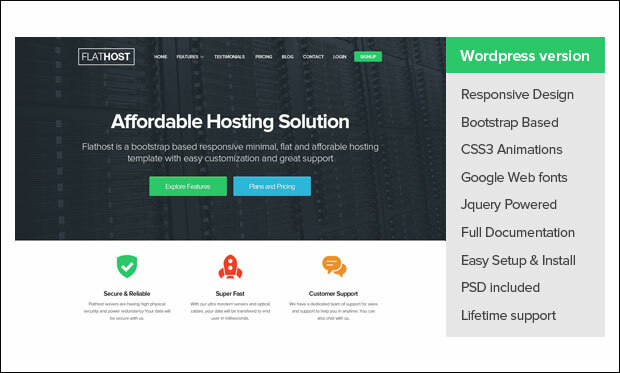 Wowhost V2 is a minimalistic designed WordPress theme for web hosting and domain seller companies who want to build powerful website to improve their online presence. This responsive theme provides visitors a great viewing experience from their tablets, smartphones and mobile devices. It features touch enabled home page slider, chic menu, hosting icons and 3 colour schemes. It is compatible with modern web browsers out there. HostChilly V3 is ideally designed for web hosting sellers to help them create their own site and showcase products in a professional way. It includes a working contact form to allow visitors to send queries, feedback and other messages to the administrators of the site. It includes security payment mode icons and WHMCS order form templates. You can make use of the extensive documentation for solving the potential queries related to the theme. Hosting is attractive WordPress theme with fully responsive layout from Template Monster. This theme is fully editable to suit the needs of users while creating their own site. Different custom post types included for inputting data are standard, link, quote, image, audio, video, gallery and aside. It is multilingual ready and compatible with WPML plugin for translating posts and pages to various languages. 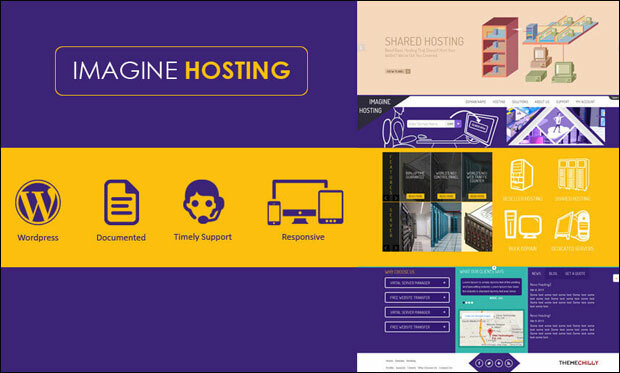 Imagine Hosting is a responsive WordPress theme that provides visitors a remarkable browsing experience from their tablets and android devices. It includes WHMCS order form templates, VPS Multiplan slider, features and server slider, content rich pages and breadcrumb navigation. Whenever you face any issue then the extensive documentation will come in handy. It is tested to run well on major browsers like Chrome, Firefox, Safari, Opera and Internet Explorer. 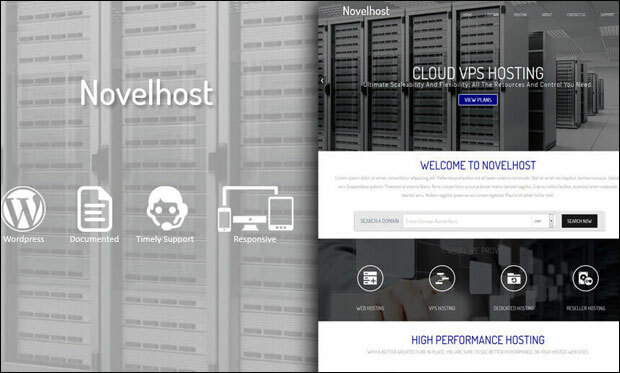 Novelhost is a responsive WordPress theme especially meant for VPS and hosting sellers to help them build their own site and showcase products professionally. Users can easily setup their own site with the help of extensive documentation and PSD files. You can display client testimonials using the testimonial slider. Important features are content rich pages, VPS slider, homepage slider, contact form and breadcrumb navigation. 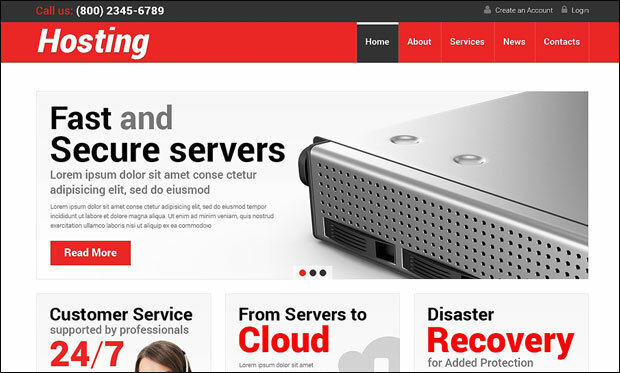 Hosting Solutions is a fully responsive WordPress theme suitable for creating hosting websites. This theme is compatible with the latest released version of WordPress. You can easily input data into the site using different custom post types and formats. It includes 80+ shortcodes for adding rows, columns, testimonials, recent posts, elements, lists, audio and video, misc etc. 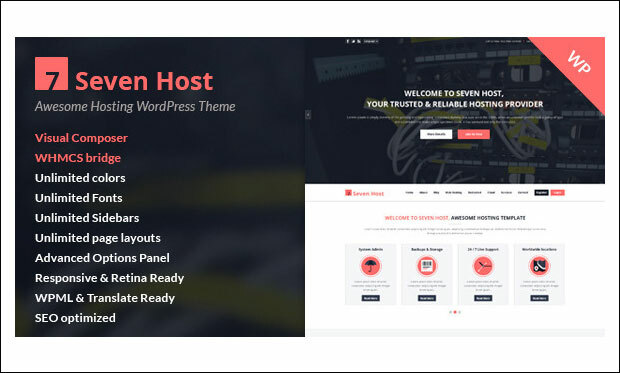 Reliable Hosting is yet another best WordPress theme for hosting companies, startups and internet marketing firms to let them create their own site without any coding knowledge. This theme includes lots of shortcodes to boost the overall functionality of the site. It is SEO ready to allow search engines to quickly crawl and index the site. You can take advanced backup of the site to secure the website content. It’s a simple hosting WordPress theme with powerful features such as multiple colour options, search engine optimization, social share icons and custom widgets. Hosting theme includes built-in theme customizer for easy customization of the site. It features two step installation process to setup the theme without worrying much about the coding part. This theme includes fantastic sliders to share images on the homepage of the website.